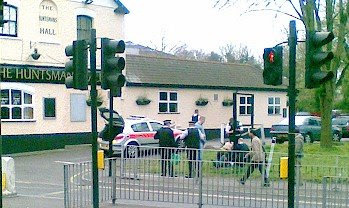 "At around lunch time The Huntsman was surrounded by police cars and two ambulances. Paramedics were giving first aid to a guy sitting on a pub chair outside by the garden. At first glance i thought this was a road trafic incident but there was also a security patrol van in attendance. It gave me the impression it might have been a fight taken outside." Well, I can reassure you that it was not a fight, but an injured cyclist - attended to first (as you can see from the picture above) by a couple of Police Community Support Officers and a patrol car and later joined by a Police transit van, a rapid response paramedic car and an ambulance.